Transhumance is a mobile livestock farming method that is based on regular, seasonal movements. The movements are mostly predictable; each year, herders follow the rhythm of the seasons and pass over the same trails and pasturelands that they already know. On the other hand, nomadism is characterised by the continual and unpredictable movements of all members of a family or a group. Most agro-pastoralists in the Sahel today practice semi-transhumance. Only a part of the family moves according to the seasons, while the rest of the family practices sedentary farming. Agro-pastoral livestock farming is prevalent throughout West Africa. Animals move within Sahelian countries, from Sahelian countries to coastal countries and within coastal countries. Livestock farming is probably the most integrated economic activity in West Africa. Every year, hundreds of thousands of animals are moved to supply coastal markets. 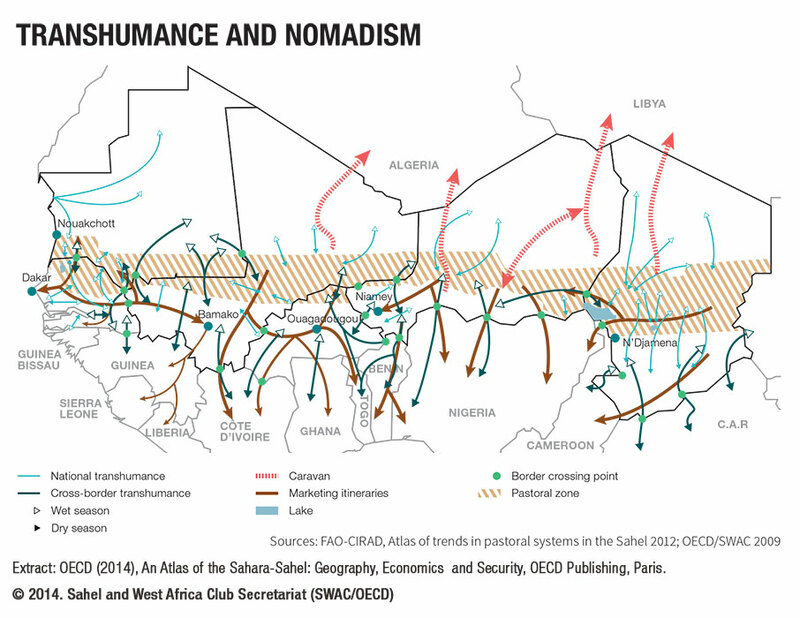 These internal and cross-border movements are often sources of conflict between sedentary farmers and transhumant agro-pastoralists. However, transhumant livestock farming also contributes to the development of abandoned and isolated areas by ensuring a human presence in areas with significant security issues.